If you are planning to use your swimming pool this weekend, there’s a number of things you can do right now to make sure you are not overwhelmed with things when the weekend arrives. In this article, we list all the things you can do to make sure getting your swimming pool ready for the weekend goes quick and smooth. We list them in roughly the order you should be doing them. Some things like water balancing take time to work. We also mention which you can do, and which your local pool service company can or should perform. If you are unable, don’t know how, or feel uncomfortable with interacting with areas of your pool, write these down and have your pool service company do them. We start with your swimming pool. Is it already open for the pool season, or do you have a local pool service company do this? Call to them to schedule and opening, and be sure to ask exactly what they will do an how much it will cost. If your pool is covered, remove the cover, or open the cover if you have an automatic pool cover. What do you see? Is the water Cloudy? Green? Filled with debris? Crystal clear? We’ll explain what to do in each of those cases, but next thing you can do right now is inspect the swimming pool. Check your skimmer basket first. This is where excess debris builds constantly. Leaves, insects, seeds from trees, even frogs or toads might be already waiting for you in your skimmer basket. Look into your pool. Are your water inlets clogged as well? You might have leaves and debris from last season built up around them. Next check your pool pump basket. Turn off your pump and open the basket housing. Unless you or your pool service company cleaned it out last season, it’s likely filled with debris. You likely have a main pool filter, such as a sand filter. There likely is a pressure gauge on your main pool filter. If the pressure is getting high, you may need to backwash. If your pool is extremely full of debris, you might need to backwash, vacuum the pool, then backwash again. Do you have any other filters? If so, check them. You risk damaging equipment if filters and baskets go unchecked and they become clogged. Your pool pump: Assuming your pool water is clean enough to turn on AND you or your pool company has opened the pool for the season, you can try to turn on your pool pump. Does your pump turn on? Does water flow through it? Are there any loud noises, screeching sounds, or does the pump sound like it’s having to work harder than normal? Your pool water heater: If you have a heater, make sure your pool water pump is first running ok, then turn the heater on. Make sure it turns on, on AND actually heats. Most gas powered heaters need to be regularly cleaned out. Soot can form over heat exchangers, mice and insects can take up residence in them leaving leaves and debris in the heater, and water can penetrate and rust and corrode surfaces. Have your heater checked every spring, and ideally mid summer as well. If you have an automated pool cover, make sure there is no damage to it. Rabbits have been known to chew through cords, mice chew through the cover, ice might puncture the cover, and the cover may no longer operate evenly across the pool. If you have any lights in the pool, fountains, or other gadgets, make sure these operate ok as well. Is your pool losing water? Water evaporates from the pool and reduces the level, but if you notice your pool unusually low or losing more water than normal, you might have a leak. Leaks might also occur inside your pump, valves, and connector housings as rubber gaskets eventually dry out. After months of non use, this might be the time they finally fail…just in time for your weekend gathering! If you have a concrete, shotcrete, gunite, or fiberglass pool, you should be looking for cracks. If you have a vinyl liner pool, you should be looking for punctures or tears. Are there any strange noises? If anything makes a funny noise our outright does not work, you might need to call your local pool service company. Are there any strange smells? If you have a chlorine pool, you’ve shocked or otherwise added chlorine to your pool and you smell an unusual amount of chlorine, you might have a high amount of chloramines in your pool. This means the chlorine sanitizer is doing its job, but you might also have combined chlorine chlorine as well. Downwind from your heater, do you smell a putrid unburned gas smell? If so, your pool heater is likely sooted or the gas to air mixture is incorrect. In both cases, you need to call your pool service company as your heater needs maintenance. You need to check the water balance before you use the pool, ideally several days before anybody jumps in. You can check the water or have your pool service company come and do it. Or bring in sample. You need to see where you are at, and what you need to add before the weekend to give the water time to balance. After sitting unused during the winter and early spring, your pool might lack adequate sanitizer if you have a chlorinated pool. See [link to adding chlorine in pool]. You might also have to shock your pool if enough contaminates have caused your pool to become cloudy. Your pH might be too high, or possibly you need to raise your alkalinity. Green water can either be a minor or major problem. You need to have the metals tested in your water. If your water contains no metals, the problem is likely algae growth. Green algae is easily removed with shock and algaecide to follow up, although if your walls are stained from algae, you might need an acid wash. If your pool water test reveals you do have metals in your pool (copper being a common culprit), then your water has been damaging copper surfaces within your pool and equipment. If you have a heater, there likely is a copper heat exchanger that’s been eroding from the inside out. In either case, you need to have your water thoroughly tested and analyzed what the problem is. Sometimes after a big storm, or you just were behind on cleaning, debris can overwhelm the pool. Particularly if you do not have a pool cover. Leave, tree branches, dead animals like mice and frogs, pollen and seedlings from plants and trees can completely cover a pool. If you have a pole with a net, you can scoop out the majority of this debris. Don’t expect your skimmer basket and filters to just make it go away. You’ll simply move the problem into your equipment. Once you have the large pieces of debris removed, you can use other cleaning equipment like a hand vacuum, “Kreepy Krawly” or similar automatic pool vacuum, or even a pool cleaning robot if you have one of those. What if my pool water is crystal clear? There might be nothing wrong with your water, or you have water that’s out of balance that just so happens to be clear. A pool with low pH and overly high chlorine levels can make your water clear, but is actively damaging pool walls and surfaces. Again, testing your water is the most important thing you can do. If you have clean and balanced water, at least you know you can use the pool this weekend. If you pool is low on water, add water until you get it to your desired amount. Low water level when you start the pool up at the start of the season is normal, but if you notice the water level going back down quickly, you might have a leak. If you do add water, be aware your water balance might change. Chlorine is diluted and reduced, pH or alkalinity might raise or lower depending on your water. Retest your levels after adding water. If you live in northern climate, the water is probably cold. Do you have a pool heater? Now’s the time to start bumping up the temp on the heater. No need to put the temperature at your desired comfort level just yet, but by the day before make sure it’s at a temp you are confident the heater can get the pool to by the time your guests are there. Generally pool heaters are best heated in stages. Get the pool water to a certain temperature, give the heater a break, then bump it up to another level. Look at the weather for the day you plan to use it. If it’s windy and colder than normal, this may take time for your pool to get to your desired temp. At this point, you know your pool is working (or you know what’s wrong at least) and your pool water is balanced (or getting there). Now you can move on to the area around your pool. You should think safety first when considering the area around your pool. Injuries around residential pools are common, and it’s the homeowner who is responsible for any injuries. Outdoor area around pool Do you have a concrete pool deck? Check for new cracks or portions of concrete that have become cracked and loose. 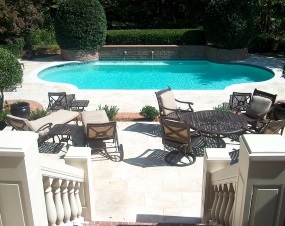 In northern climates, the freeze-thaw cycles can quickly widen cracks, heave entire portions of your pool deck. Do you have paving stones, or brickwork on the ground? They often become loose as well. Make sure each allows for a firm footing to prevent trips and falls. You might have a wood deck instead. You need to inspect for broken and loose boards, loose nails and screws, drying and splintering wood, dry and wet rot. Outdoor above ground pools often have a wood deck, and having a save pool deck is even more important. You also need to apply an outdoor stain and sealant to protect the wood from the elements. If you live in climates where your pool area freezes during winter, your should be completely covering and wrapping your diving board. Water can work its way in and destroy your diving board over time, making it very unsafe for use. Look for cracks in the surface, and loose fittings. There are specs on how tight bolts should be tightened on slides and pool decks. If you have any doubt, have your local pool service company look these over. You should be confident your pool slide and diving board is in good condition before having guests over. You likely have a fence around the pool. Make sure fence door latches work, lock and unlock if they are lockable. Also look for rusting fasteners and screws. If you notice any are rusty, replace these with stainless steel screws rated for pool installation. Algae might have already taken hold along your pool walls and floor. You might not see it, but it can make surfaces extremely slippery. It’s often the first person entering the pool that experiences the unexpected slippery surface. You don’t want a fall and injury to happen before your pool gathering even starts. If you have outdoor lights around your pool, you should check to make sure they work. You might also have speakers and a sound system. Going through a quick test will save you last minute trouble shooting while your guests are arriving. Do you have an outdoor kitchen? Do you plan to use your grill? Water, electrical, any gas lines…test everything. Turn on your grill to make sure it heats as expected. You should consider cleaning out your grill as well, especially if you have never done it and it’s been a few years since you purchased it. It’s likely extremely filled with gunk. If your grill is propane powered, make sure you have a fresh tank. Even better, alway have an extra filled one on hand. It’s very easy to just swap the empty one out with the full one if that time comes. It’s embarrassing to run out of gas before food is cooked! If you’ve done all the above correctly, your pool, water, equipment, and immediate pool area are hopefully ready to be used all season long. Your water might still be balancing, your filter might be clearing up the water, the heater might still be heating the water, and you are waiting for the pool company to show up. This means you have some time to wait around…you now have time to proceed to part 2…Get supplies and prepare! We are working on Part 2…Sign up to our mailing list to be notified when Part 2 comes out.